Crazy as it sounds, most older flat roofs in the UK have little or no insulation. So every time the heating goes on, heat and money – disappear through the roof! You don’t have to live with this! Unfortunately most flat roofs have little or no insulation. To be clear – having a COLD ROOF is not necessarily a bad idea – and the term often creates confusion. 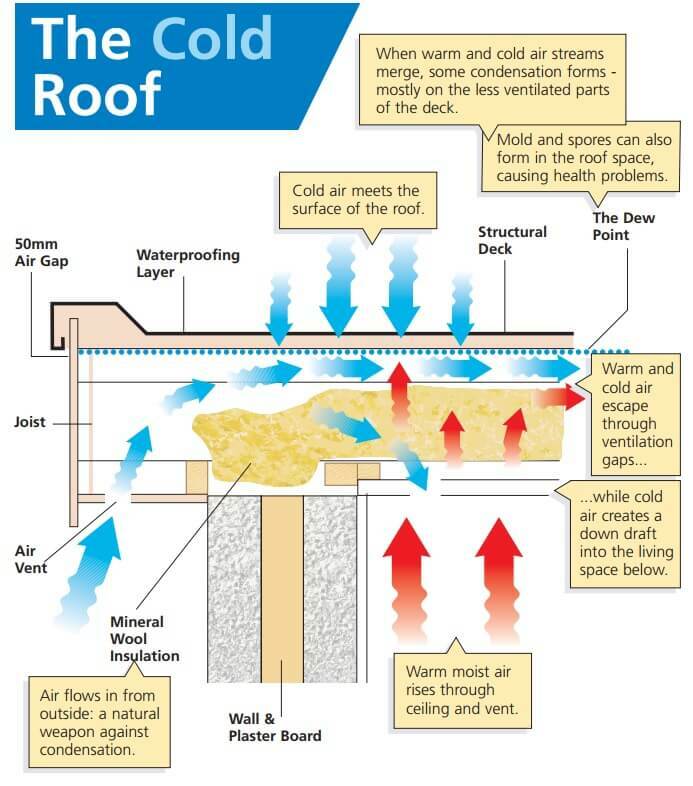 You see, a COLD ROOF STRUCTURE is a term used to describe roofs with no insulation, little insulation or even substantial insulation between the joists. 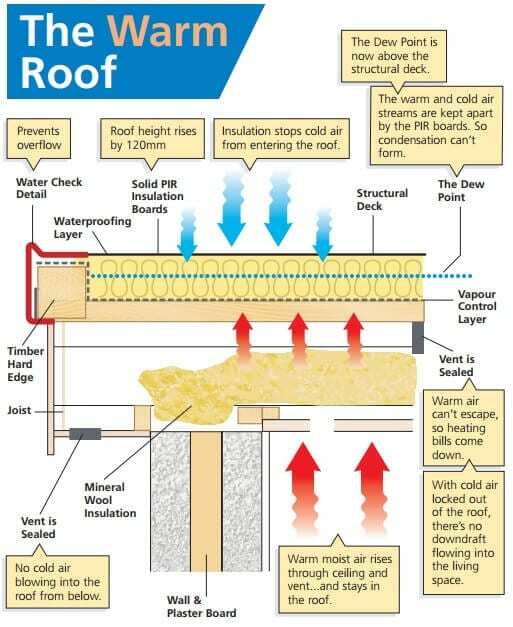 A COLD ROOF is only a bad idea when the insulation installed does not meet the requirements of building regulations. That said, in the UK far too many COLD ROOF STRUCTURES just are not up to the job of providing adequate insulation. With basic rock wool insulation fitted between the joists and small ventilation gaps to let air flow through the roof – the theory is that the air flow will blow away the condensation that forms on the structural deck – just like switching on your car’s air-con to blast away mist from the windscreen. It’s all good in theory. a) The basic insulation provides very little insulation and heat escapes quickly. b) The ventilation gaps allow cold air to blow downwards, chilling the space below. c) Inside the roof, cold and warm air streams merge and turn to liquid. Condensation follows. e) Meanwhile, the roof has become a breeding ground for black mould and spores – a serious health hazard that needs to be treated urgently. f) Frequently homeowners believe they have a leaking roof – when in fact the issue they have is condensation! A Warm Roof uses solid PIR* insulation boards that sit above the roof deck, topped by moisture-tolerant boards. This changes the ‘Dew Point’ where warm and cold air streams merge and turn to liquid. With a WARM ROOF, moisture is isolated before it can reach the roof deck – meaning condensation can’t form and weaken the structure. And as a result, there’s no need for ventilation gaps. Meaning the roof can be sealed, with no downward draft and no way for warm air to escape. So – once you convert from a cold to a warm roof, your heating bills will plummet! So what insulation do you need? It makes sound economic sense. And it’s part of a legal requirement if you’re building a new roof – or refurbishing at least 50% of a roof that sits over a living space. So any work you do needs to comply with Part L of the 2010 Building Regulations: Conservation of Fuel and Power. With so much confusion around this, so it deserves an explanation. The government wants to limit every property’s impact on the environment. So targets are set around “U-Values” – the measurement used to score building materials for energy efficiency. A low U-Value is good, as it means less energy escapes. So your roof has to meet – or fall below – a maximum U-Value. You can’t meet these targets with a Cold Roof using traditional rock-wool! You’d need 120mm (4.7 inches) of insulation to achieve a U-Value of 0.20. A typical flat roof won’t have enough space between the joists to meet this requirement by the time you also factor in an air gap as required in a Cold Roof Structure – unless the joists are replaced with larger joists – meaning you reduce your ceiling height. For most people this is just not a practical solution. But with a Warm Roof, it’s easy. PIR* boards are high in density. With the right spec and fitting, they’ll achieve a U-Value as low as 0.11, with room to spare in the roof. Keeping you well below the threshold, so your roof is fully compliant. A Warm Roof will lower your heating bills, eliminate condensation and meet building regulation targets. * PIR (polyisocyanurate) Boards. Polyisocyanurate (PIR) is one of the most efficient insulation material used in construction. This product is an improvement of previously used PUR boards (polyurethane), typically produced as a foam and used as rigid thermal insulation. What Type Of Waterproofing is best with a Warm Roof? => PVC Single-Ply Waterproofing Membrane. Of all these flat roofing options we recommend the PVC Single-Ply Waterproofing Membrane above all others and in particular the VANGUARD Brand. Waterproofing a flat roof is a bit of a lottery. Unless you choose the one truly reliable system: PVC Single-Ply Waterproofing. PVC Single-Ply Waterproofing stands head and shoulders over the alternatives. 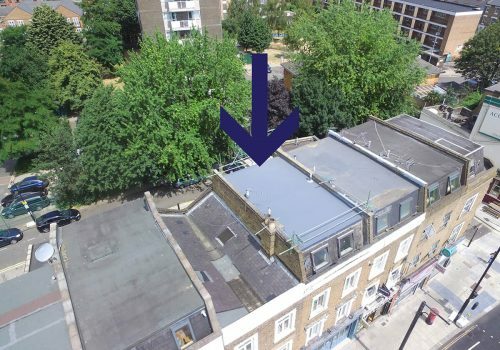 It’s the only waterproofing system purpose-designed for flat roofs – so uniquely able to deal with all the usual hurdles found on flat roofs such as standing water, (ponding) falling slates and vulnerable joins. PVC Single-Ply Waterproofing stands up to all weathers, while keeping its appearance – with little or no maintenance.